They claim to purify the air to 99.9%, but reading the fine print, they are just filter systems that take out the larger particles to this level. VECOTHOR AIR160 is different. It can actually deliver on its promise because it uses three different high-perfomance technologies: Filtration, UV-C Light Disinfection AND Air Ionization, to eliminate contaminants and micro-organisms. breathe in indoor environments. These can include viruses, bacteria and moulds. These all make our air less healthy to breath. VECTOTHOR AIR160 is a compact, stand-alone system, immediately ready-for-use with simple installation and maintenance. Easy to service, stylish and effective it’s the perfect air purifying system for so many applications. 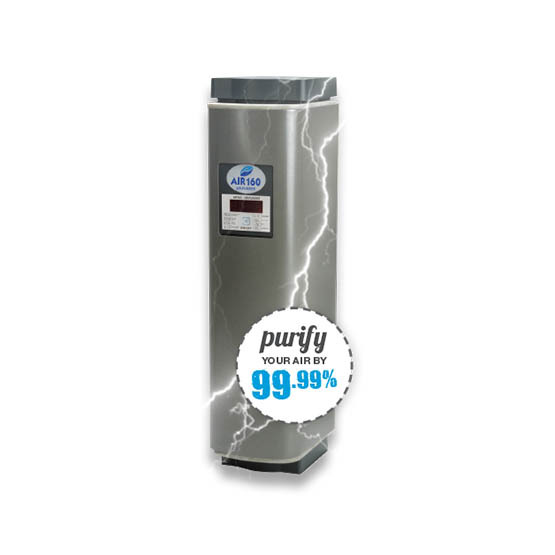 • After the UV-C treatment, the ionizer launches 8.5 million negative ions per cm3 into the treated air. ions, as do dust, pollen and other pollutants. Fresh air typically contains up to 4,000 negative ions per cm3, but this figure is much lower in enclosed rooms, often well below 50 ions per cm3. • The negative ions introduced by the VECTOTHOR AIR160’s Ioniser form compounds with the positive ions present. The compounds thus formed are too heavy to float in the air; so they sink down and are captured by the 3M HAFE filter. • The large number of negative ions produced improves the resistance of the human body, and may even promote healing processes. • The air is then treated with UV-C radiation via the high-performance Philips UV-C lamp, generating ultraviolet radiation with a wavelength of 253.7 nm. 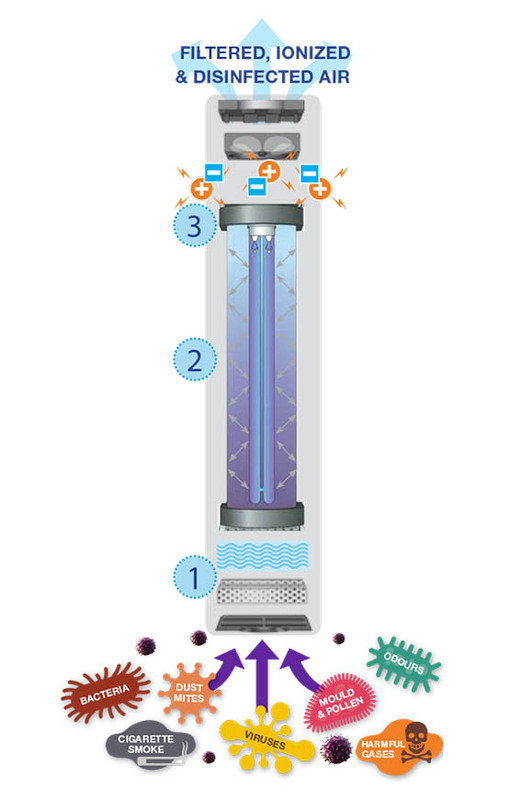 The UV-C light destroys the DNA (cellular structure) of viruses, bacteria, moulds, fungi and other micro-organisms and prevents their reproduction. This ensures disinfected air, free of these dangerous micro-organisms in a healthy and efficient way. into the centre of the Chamber, to better ensure the total destruction of micro-organisms, since they are hit with UV-C radiation from all angles. • A quiet, high-performance Ventilator draws the air through a hospital-grade 3M High Air Flow Electrostatic (HAFE) Filter into the Disinfection Chamber. maximum particle removal and maximum airflow. • The 3M HAFE filter also keeps the Disinfection Chamber of the VECTOTHOR AIR160 cleaner, so optimised air disinfection is guaranteed. • The 3M HAFE filter includes an antimicrobial agent that prevents mould growth further increasing performance. • Airborne dust capture also helps maintain productivity of in-room heating and air-conditioning units.